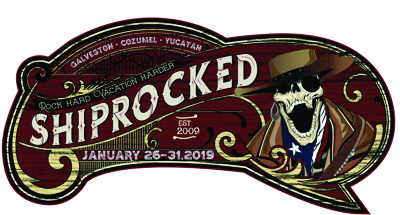 ShipRocked 2019 is sold out, but the music lineup keeps growing for the 10th edition of the ultimate rock music cruise vacation January 26-31, 2019 onboard Carnival Valor, departing from Galveston, Texas, with stops in Cozumel and the Yucatán in Mexico. Royal Thunder and Rivals are the latest additions to a bill that's led by Papa Roach, along with Bullet For My Valentine, I Prevail, Nothing More, Suicidal Tendencies, Sevendust, Motionless In White, comedian Brian Posehn, and many more. Joey Belladonna and Frank Bello of thrash legends Anthrax, 12 Stones singer/guitarist Paul McCoy and members of Blacktop Mojo join The Stowaways, presented by Keep The Beat Alive (www.keepthebeatalive.org). ShipRocked's own all-star band The Stowaways will also feature Brian "Head" Welch (Korn), Ron "Bumblefoot" Thal, David Ellefson (Megadeth), John Deservio (Black Label Society), John Tempesta (The Cult) and many more. "Keep The Beat Alive is very excited to partner with ASK4 Entertainment for ShipRocked 2019! KTBA is dedicated to cutting the incidence of cardiac death in touring professionals, by installing first aid kits and AEDs in tour buses across America and certifying staff via the American Heart Association's Heartsaver certification program. KTBA is the only organization recognized by the AHA for certification nationally," said Damian Brezinski, Founder, Keep The Beat Alive. 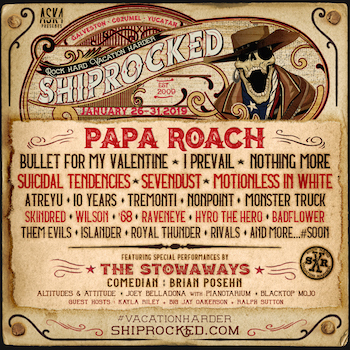 The current music, comedy and special guest lineup for ShipRocked 2019 is as follows: Papa Roach, Bullet For My Valentine, I Prevail, Nothing More, Suicidal Tendencies, Sevendust, Motionless In White, Atreyu, 10 Years, Tremonti, Nonpoint, Monster Truck, Skindred, Wilson, '68, RavenEye, Hyro The Hero, Badflower, Them Evils, Islander, Royal Thunder, Rivals, Brian Posehn (comedy), Altitudes & Attitude (David Ellefson & Frank Bello), Joey Belladonna with Pianotarium, Blacktop Mojo, and more, along with guest hosts Kayla Riley, Big Jay Oakerson and Ralph Sutton. Produced by ASK4 Entertainment, ShipRocked is a once-in-a-lifetime experience that provides guests with the opportunity to vacation with their favorite bands, meet new friends, and reunite with old ones year after year. In addition to unique performances and musical collaborations, ShipRocked onboard and beach activities include photo meet and greets with band members, artist hosted events and activities, crazy theme nights, after hours parties and more. Loudwire called ShipRocked "…a staple of the hard rock and metal event calendar [March 1, 2017]."